Nail fungus, or onychomycosis, is a chronic nail disease that affects about 10% of the population.Treatments for onychomycosis include topical medications that can be ineffective and oral drugs that are usually costly and have potentially serious side effects. 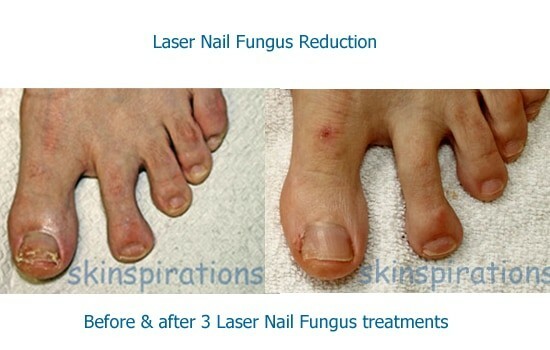 One of the latest treatments useful for clearing nail fungus is laser therapy, such as our FDA-approved GenesisPlus laser treatment. The GenesisPlus laser treatment does not require any anesthetic, and you can resume normal activities immediately afterwards. Any nail polish should be completely removed from all 10 toes or fingers before arrival. During the treatment, laser energy pulses are "painted" over the nails, warming them gradually & painlessly until they get to the target temperature. Usually all 10 nails are treated, even if not visibly infected, and the treatment takes about 30 minutes. Nail polish can be applied immediately after a treatment..Skinspirations recommends and carries daniPro polish, which is infused with antifungal medication and comes in a variety of beautiful colors. Patients start with a package of two GenesisPlus nail treatments done four to six weeks apart. Since the nails grow very slowly, especially toenails, results may not be visible for up to 6-8 months, and nails that are discolored because of other causes will not respond. Because onchomycoses is a chronic condition, long term maintenance with 2-3 treatments per year are recommended. We also strongly encourage the use of antifungal shoe spray & an oil-based anti-fungal medication such as Formula 3, during & continuing on after a treatment series. 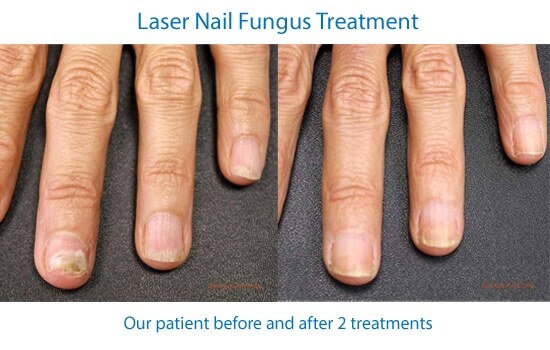 If you've been diagnosed with onychomycosis (nail fungus), call Skinspirations today at 727-571-1923 or register online here to schedule a complimentary consultation to learn more about our GenesisPlus Laser Fungus treatment.